Stewed Italian Tomatos – a summer harvest must! 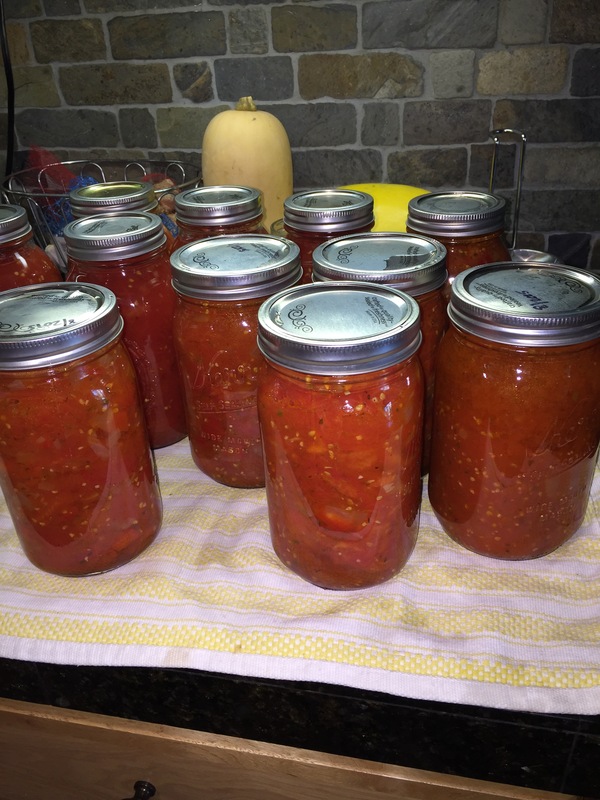 My amazing mother-in-law Ann got me hooked on the multi levels of gratification from canning. She and I make it weekend events with tomatoes, peaches and pears as seasons deliver. She will bring full bushels from the valley farms super ripe. My all time favorite is stewed italian tomatoes. A winter “must have on the shelf ” staple. This is a cook up – whatcha got recipe… so you cant mess it up on measurement. Prep jars for canning. Follow ball jar instructions. I prefer to water bath mine and I heat jars in oven as I work, wide mouth are really great to use as well. Dutch oven or large stock pot sautee in olive oil chopped onion , chopped peppers, garlic and seasonings. Once limp add tomatoes and sugar. Simmer low boil 45 min- hour. Gently add hot tomatoes to hot jars and lid. Pre-prep is crutial with your jars. Follow water bath instructions with Ball. Youll see I have recipes that refer to my stewed and jarred tomatoes often.